Celebrating back to school around here means that we're getting a whole host of lunch box notes ready to go. These little love notes have become a treasured part of my communication with the kids while they're away at school. We retell jokes on roadtrips, and my oldest is challenging herself to come up with original jokes all the time. When they heard that I was going to be doing a back to school project, they asked for a little something special for their lunches. Hence the birth of the lunchbox whiteboard. This project is a breeze to make (you can even have your kids make it themselves), and it will bring smiles for a long time to come! Grab an inexpensive, small frame (we bought ours at CVS, and it's 3"x3"). Painting is not necessary, but we wanted chalk paint on the frame so that it could be decorated for special occasions like holidays and birthdays. Trim a piece of notebook paper to fit in the frame. Assemble. 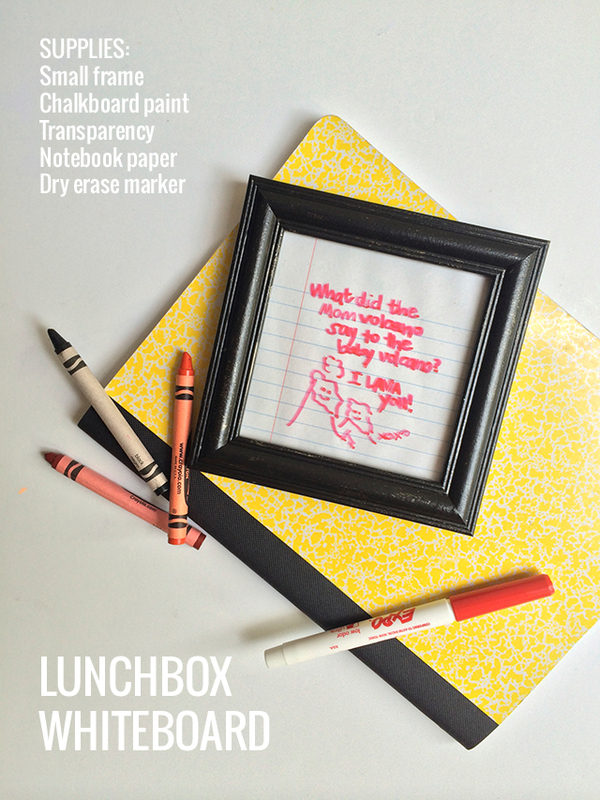 Write your note, create your joke, or draw your doodle with a dry erase marker. I recommend keeping the frame in the front pocket of a lunchbag if possible just to keep the food and drinks away from the frame. If that's not an option, consider wiping down your frame and pen as you pack the lunch. If you're looking for joke ideas, follow me @parscaeli on Twitter or Instagram or Facebook to see a daily joke. We'll begin a fresh school year of giggles next week. And you can always search the archives by following #pc_lunchboxnotes (over 100 in there to get you going). I have one more awesome surprise today. We're making chic mouse pads as a part of this series. Head over to Frock Files to see the incredible work of Joy. So good. The watercolor effect and the perfect typography. Thanks to all who helped out with this awesome week of projects. It's been a blast to see how everyone gets ready to school in their own very cool way. Are you ready to head back?